While "wolf teeth" sound like something out of an equine vampire movie, these small teeth can cause big hassles for horse owners and horses alike. 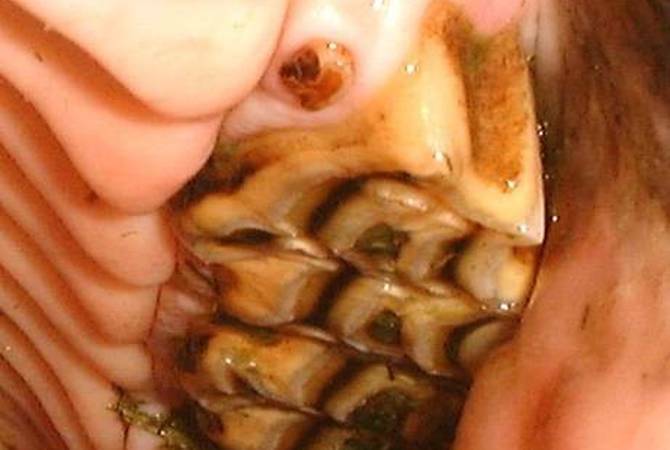 Most horse teeth are classified as hypsodont teeth. These teeth erupt gradually throughout the horse's lifetime. Teeth in this category include the incisors, premolars (except wolf teeth), and molars. The other class of teeth is called brachydont. Brachydont teeth erupt all at once and are done growing. Human teeth are brachydont teeth. Wolf teeth fit into the brachydont category along with canine teeth in horses. Wolf teeth are considered to be vestigial premolars. They show up right in front of the second premolars. An individual horse may have none, one, two, or four wolf teeth. Generally, a horse with wolf teeth will have just two - both located on the upper jaw. Standardbreds, as a breed, are more likely to also have wolf teeth on the lower jaw. Rarely, a horse will have double wolf teeth. Sometimes there are wolf teeth present that don't break through the gums. Called "blind" wolf teeth, these can cause problems as well. Some horsemen feel these "blind" teeth are actually worse than the erupted wolf teeth. Wolf teeth appear in about 13 to 32 percent of all horses. They can show up in both sexes. Mares may be slighlty more likely to have wolf teeth (as opposed to canine teeth) than geldings or stallions. There are no "baby tooth" or deciduous versions of wolf teeth. If your horse is going to have wolf teeth, they will usually erupt right about five to six months of age. Rarely, wolf teeth may show up as late as two to three years of age, but most yearlings obviously either have them or not. A few horses never have a problem with their wolf teeth, but many horses do. Since wolf teeth do not serve any good purpose, removing them makes good sense. It makes sense to remove these potentially troublesome teeth before you attempt any serious work with your young horse. You don't want your horse to associate any discomfort or pain in his mouth with being worked. Wolf teeth are on the bars of the mouth and where the bit may settle. For this reason alone, they may need to be removed. Wolf teeth can cause a young horse to fight the bit or even the pressure of a hackamore. Any pressure on the horse's cheeks is capable of rubbing on these teeth. Wolf teeth tend to be pointed, so they can cause some discomfort. Most horse owners and veterinarians plan to remove any wolf teeth at about a year of age. Young horses should receive frequent dental checks to detect any malocclusions, to remove any "caps" leftover from baby or deciduous teeth, and to pull any wolf teeth. Removing wolf teeth is definitely a job for your veterinarian. Your horse will require some sedation and a nerve block at the root of any teeth to be removed. Luckily, wolf teeth tend to have shallow roots. In fact, on occasion they may fall out on their own. In general, however, a fairly strong ligament holds the wolf teeth in place. With shallow roots, wolf teeth can be loosened up around the edges of the tooth, breaking or stretching the periodontal ligament, and then lifted out. Your veterinarian will try not to break any roots off of the teeth. Broken roots may simply dissolve in place or they may work their way to the surface and need removal in the future. If a broken root protrudes above the gum, it will cause pain and require immediate removal. Serious complications from the removal of wolf teeth are very unlikely. For blind or unerupted wolf teeth, your veterinarian may take radiographs (x-rays) of the jaw to determine the extent of the roots. Sedation and a local nerve block will again be necessary to safely remove these teeth. Blind wolf teeth that are left in place can be more difficult to remove in an adult horse. The roots can develop and become attached to the underlying bone. Postoperative care for wolf teeth may range from nothing for teeth with very shallow roots in young horses to daily lavage (flushing) to keep food from settling into the healing wound site for a week or so for teeth with deeper roots. Most horses heal quickly and without incident. Sometimes, veterinarians will follow up wolf teeth removal with floating any rough edges on the upper and lower second premolars. These teeth can have sharp edges that will also either interfere with a comfortable seating of the bit or irritate the cheek from noseband or hackamore pressure. Too much dental shaping can lead to dental problems down the road, but minor adjustments may help a young horse in training. If you have an adult horse who consistently fights the bit or acts uncomfortable, it is worth having your veterinarian do a thorough dental exam. Radiographs may be required for detecting blind wolf teeth, though they can often be felt under the gum in a very quiet or sedated horse. An old horsemen's saying is, "No wolf tooth does any good and may do harm, so extract them all." Certainly, if your horse is performing well, has no problems, and a wolf tooth finding is just an incidental, you may not want to put him through the procedure to remove the teeth. Their presence should be noted though, and if problems do show up, such as head tossing, avoiding the bit, etc, wolf teeth removal should be considered. There aren't many equine dental care books that are suited for the horse owner. Most are directed at the dental practitioner. Caring for the Horse's Teeth and Mouth is one of the few that would be a great addition to any horse owner's library.